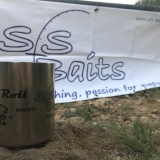 SFS BaitBox - SkopexButter inkl. Liquid + Powder! SFS BaitBox - BananaFish inkl. Liquid + Powder! SFS BaitBox - Red Tropic inkl. Liquid + Powder!